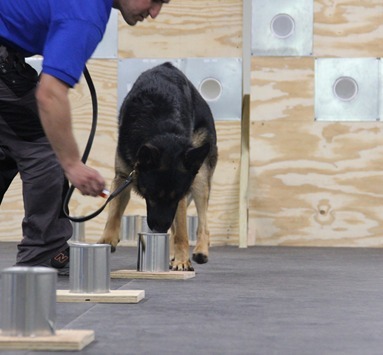 “Bomb dogs” receive specialized training in order to accurately detect the presence of explosives. 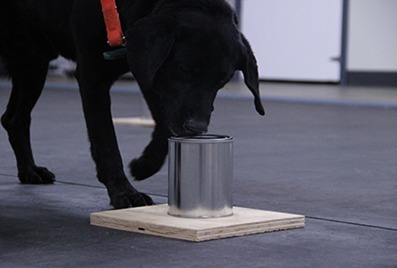 These talented canines learn to use their sharp senses of smell in order to find bombs, which may then be defused by explosives specialists, such as law enforcement or military personnel. Paw Palace’s process of explosive (bomb) detection dog training is quite involved, and every canine will not make the grade. However, dogs that do move through this form of training successfully go on to contribute to society in very important ways. A range of explosive substances will be used during the training process – examples include Semtex, dynamite and ammonium nitrate (to name just a few). As with other types of canine detection training, dogs will link the smells of explosives with the smell of rewards, such as toys or towels. In other words, trainers will begin to play with canines, getting them used to fun playtime which utilizes certain toys. Then, they will begin to add explosive substances to toys (without risking the animal or trainer’s health and safety). At this point, the dogs that are being trained will begin to associate these smells with rewards, and they will sniff them out as commanded by their owners or masters. Dogs will relate “finds” to their owners/masters by assuming a particular position or stance. Some canines of this type will “sit” when they’ve found explosive materials! Dogs which receive this form of dog training learn a range of practical skills, such as obedience, the ability to focus in even the most chaotic atmospheres, such as places where firearms are being used, and how to search a host of environments, from skyscrapers to cars and beyond. These canines also learn how to search bags in order to find stashed drugs. This skill comes in handy in airports, which are now more security-conscious than ever before. Now that you know more about Paw Palace’s experienced explosive (bomb) detection dog training program, you’ll be able to decide if your own canine is a good candidate for this process. Suffice it to say that this isn’t the sort of dog training that you can do on your own! Therefore, you will need Paw Palace’s canine drug detection training program to help you reach your goals. Another option is to consider purchasing one of Paw Palace’s own dogs, which has been specifically trained for bomb and explosives detection.